It was obvious that Jonathan Groff was utilizing his newfound Jesse St. James moves at his solo concert Sunday night at Joe’s Pub. Coming off his hugely popular Glee guest role as the star singer of the fledgling club’s main competition, the Spring Awakening and Hair star channeled the cocky Jesse’s moves into his performance. With a set list of funk and R&B tunes, Groff got down in a playful, silly manor that he has seldom been able to display on stage. The set list, Groff explained, was inspired by his time at Glee. While sitting in LA traffic on his way to and from the set, which he explained as a “blessing and a curse,” Groff said he immersed himself in music and the songs he chose to perform at the concert were those he sang at the top of his lungs in his car. Opening with Stevie Wonder’s “You Haven’t Done Nothin’,” the song choice came as a surprise from the usual mellow rock Groff has sung in shows. The performances came across authentic, as Groff infuses a hefty amount of genuine emotion into his delivery. Over the course of the set, which lasted just shy of an hour, Groff sang with a huge grin and constantly reminded the audience how happy he was to be there. 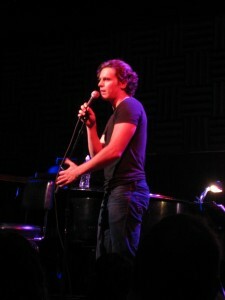 This performance at Joe’s Pub marked Groff’s first ever solo concert. He told the audience that the day he moved to New York, he attended a concert at Joe’s Pub featuring Legally Blonde star Laura Bell Bundy, and that while sitting in the audience, he vowed the day would come that he would headline the stage as well. I attended the 7 p.m. performance (there was also a 9:30 p.m. show), and among the audience members were Victor Garber (Alias, Present Laughter), and Susan Blackwell and Hunter Bell from [title of show]. Being that it was Father’s Day, Groff’s parents were also in attendance, and he regaled the crowd with a story about his dad. During the night of the Glee finale, which featured Groff in a standout performance of Queen’s “Bohemian Rhapsody,” his father, who works as a horse trainer, didn’t want to miss his son’s big scene. He went to the men’s locker room during the telecast and switched the TV from baseball to Glee. Thinking he had time before Groff’s big moment, his father left the room to do some more work and missed the segment. Groff said he and his dad rectified the mistake by watching the scene repeatedly on his DVR. Did you catch Jonathan Groff at Joe’s Pub, Rushers? What did you think of his performance and set list? Did you find it surprising to see Groff sing R&B hits? Leave your thoughts and Groff love in the comments! I love to hear Jonathan Groff sing anything, but this isn’t exactly the set list I’d have chosen for him, so now I don’t have to feel too bad that I couldn’t get tickets. Plus, I can watch your videos, so I don’t feel like I missed it. Thanks! Yeah, I was definitely surprised by the set list too. And I’m glad you liked the videos though! That’s what they’re there for—so people who couldn’t make it can get in on the action! Thanks so much for posting the videos. I must say that I was so entranced during the show that my memories of the details are a bit hazy. Afterward, I went to the restroom and, alas, when I emerged, there he was standing and talking to a small group of people. Since I had my trusty camera and I really wanted to talk to him and get a photo, I waited for a few minutes. The day before (June 19) was my birthday, and my visit to New York (from Tampa, FL) to see him was my big gift to myself. I told him that I had seen him in Spring Awakening on my birthday weekend exactly three years earlier (another birthday gift to myself), and he was so sweet, saying “I guess this is our anniversary.” I got a great photo and a sweet, sweaty hug. Love your story, Cheri! Thanks for sharing! I think you’re very lucky—a lot of people would pay good money for a sweaty Groff hug.